Do you think that “traps” like this graveyard–where the “obvious” strategy is not the best strategy, or even hurt your position–are good design? 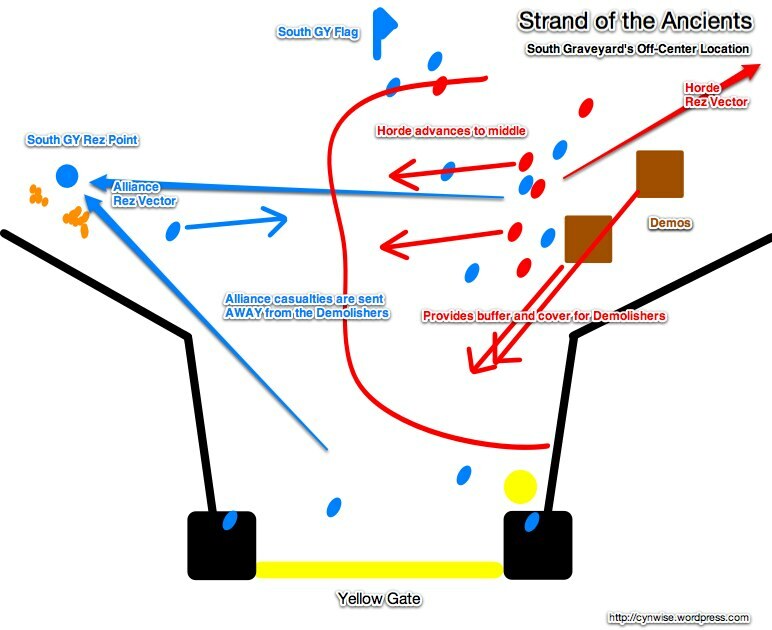 Or would Strand of the Ancients be a better battleground if South GY did not exist? I’m think primarily about transient groups, where you have new players who don’t know what to do, and who can’t be controlled by other players. In Rated Battlegrounds, not taking South GY is just a tactic your group has to learn as a whole. That’s a really good question. There is something to be said for a game where the optimal strategies are non-intuitive, where they require you to resist the obvious and think about the consequences of your actions. Having a twist like this makes a game more interesting than if taking the GY was always the right choice. But, the counter argument is that this goes against the cues and prompts offered by the game, which makes it more difficult. There’s a flag, you should capture it. There’s a graveyard, you should capture it. New players will see it and do it. Veterans (even in transient groups) will warn others away from it. The team which does the best job of persuading its new members to refuse the offered carrot has an advantage. I don’t think that part is good design. But I like that it offers something interesting, something different, something that makes you think, something that makes you adapt. So your team takes South GY, now what do you do? Do you grab bombs and run, do you send people down to the beach and workshops? How much time is left? Where are your demos now, where will they be? Taking South GY isn’t an automatic loss; it’s more like committing a 15-yard penalty when you were on the 10 yard line. Is it good design? Damn, that’s a good question. I think it’s interesting design. 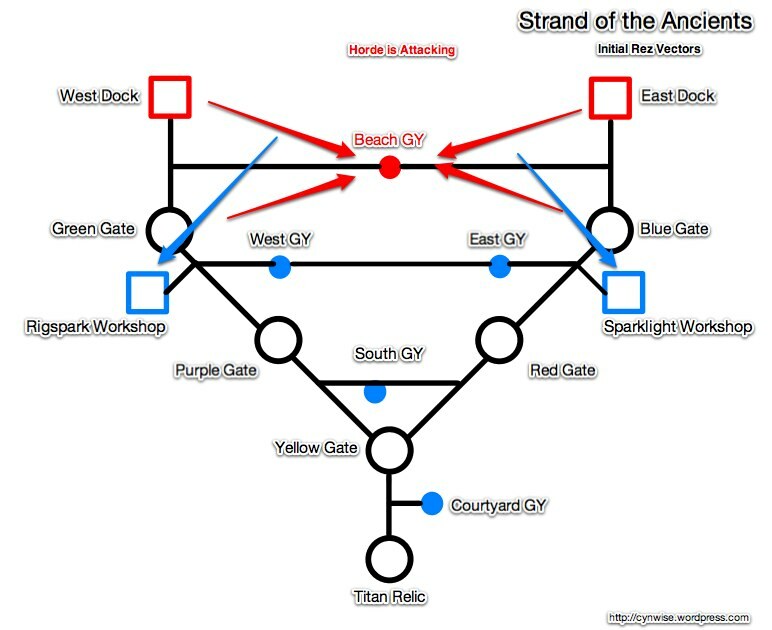 One of the flaws of Strand of the Ancients is that it’s actually kinda boring PvP, so adding this wrinkle adds strategic thinking to a match, and that’s good. I never really understood the purpose of the South Graveyard (and sometimes forget it’s even there, lol) and always wondered why people got berated for capping it. Of course, none of the berators never explained it, but your guide definitely cleared things up for me. Thanks for your wonderful PvP guides Cyn! 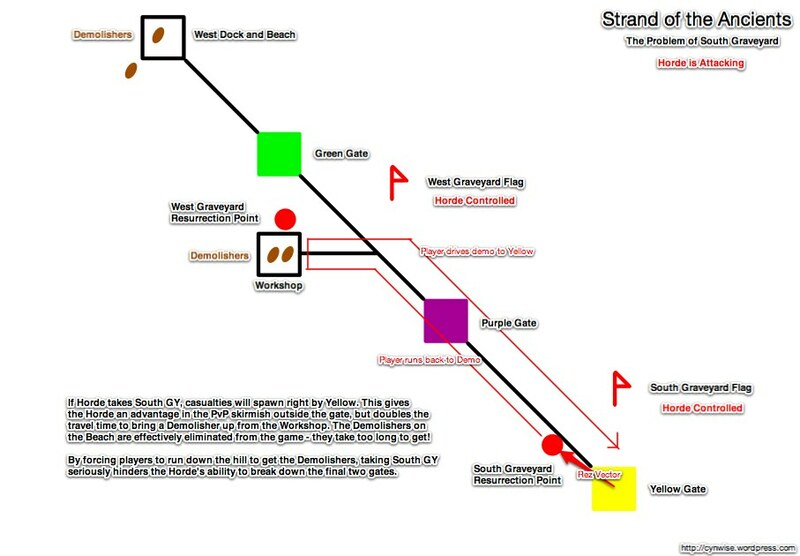 One thing you should mention about south graveyard is that flipping it does also give you east and west gys as well. The only reason I say this is there have been times that in order to flip those flags, if the defense is being really up on gy control, you can throw a hail Mary at it and sometimes, albeit rarely, come out ahead. I have a rogue with a really high win rate in strand because on offense you can skip the gate with shadow step and flip the grave right when the door falls, then on defense you control those flags. Most of the time it’s enough to help your team win. You know, I didn’t know that, yet I actually saw it in action yesterday while fact-checking some of this post. Our demos went Green – Purple – Yellow, we had West but not East, someone capped South and East flipped at the same time. I assumed that it was someone ninjaing the workshop, but in retrospect it was probably this! I’ve never really considered the positioning of south graveyard. At the start of the match you often have the ‘go green’ or ‘go blue’ calls. It would generally suggest that a go blue strategy would be superior – yet I would say I hear a go green more than blue. 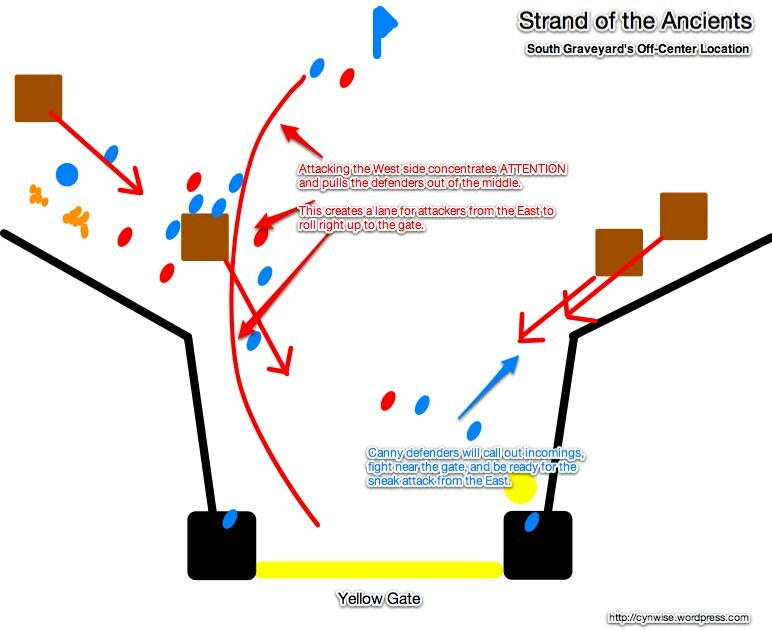 The offset is that this is more about a Zerg strategy so that if it works then the south graveyard position is irrelevant anyway. I have *so* much trouble with the orientation of this BG. I am like you, I think “up” equals “north” so even though I KNOW it’s South GY it’s still backwards. It doesn’t help that this is supposed to be in or near Dragonblight, so I think that any coast there should be south-facing (with the land on the north). I suppose this could be an island and we’re storming the northern beach of it, but still. I hear more GREEN than BLUE, but I don’t really see an advantage on the beach itself for this. Maybe there’s a trick of the terrain that causes people to favor it. Here’s what I do. I get up on the boat and go as far to the front as I can. If I’m a hunter or a priest I use eagle eye/mind vision on the enemy as soon as I can. Then you call out the door where the enemy is weaker. 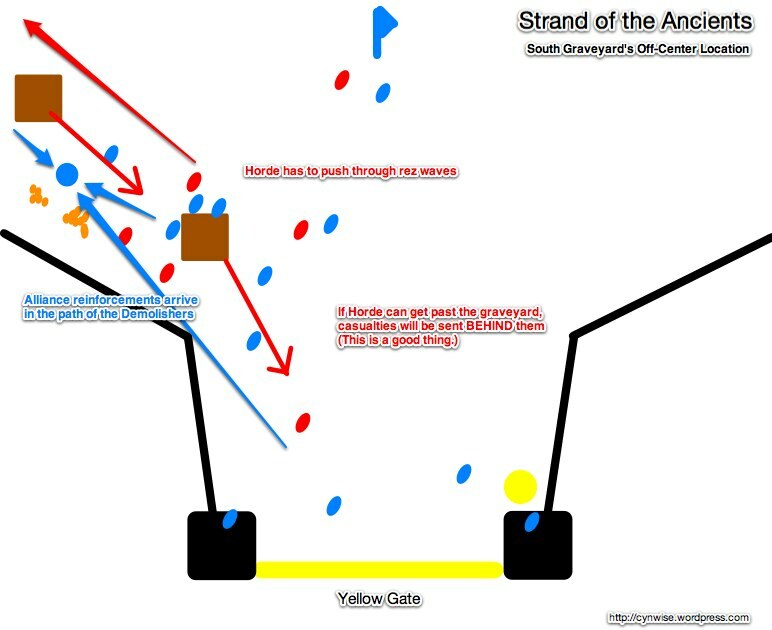 If you see a bunch of frost dks and hunters standing on blue side and not many people on green, you call out green. Another advanced SotA tactic, you can run the demo under the water with no speed penalty. I often use this out the gate to keep people from destroying my demo while getting it to the other side. Enemy will often chase it into the water because “OMG WHAT IS IT DOING!? !” and then they’re stuck being slow in the water while I easily outrun them. My former comment didn’t make a lot of sense because I tapped it out on the phone but rogues can shadowstep to turrets to bypass doors. You can’t flip graveyard flags until the door before goes down, and the bombs won’t spawn in the courtyard until yellow gate falls, but if you grab a bomb at the docks you can run it straight up to the relic door and blast it before any other door falls. I’ve often wondered if I got enough rogues if we could get the relic door down with no other doors. I could write a book on tactics for this battleground. I actually really like it because it is the one BG in wow that is perfectly balanced. I know some people don’t like it because it isn’t as KB focused as some other bgs, but there’s a lot of good tactics to be learned here. I honestly think it’s some sort of bizarre right of passage for some person new to SoA to capture the South Graveyard. You want to tell people about it ahead of time because you know someone will try to do it, but that ends up not mattering in the slightest, because someone will cap the South GY anyway. Once that’s done, your goose is pretty much cooked on offense. I agree! One of the best ways I’ve found to positively reinforce the lesson of South GY is to mock the OTHER team for doing it when you’re on defense. This sets in motion members of your own team reinforcing that it’s wrong while attributing it to a mistake “Others” make. There’s no criticism of your own team there, so people seem more receptive to the lesson. 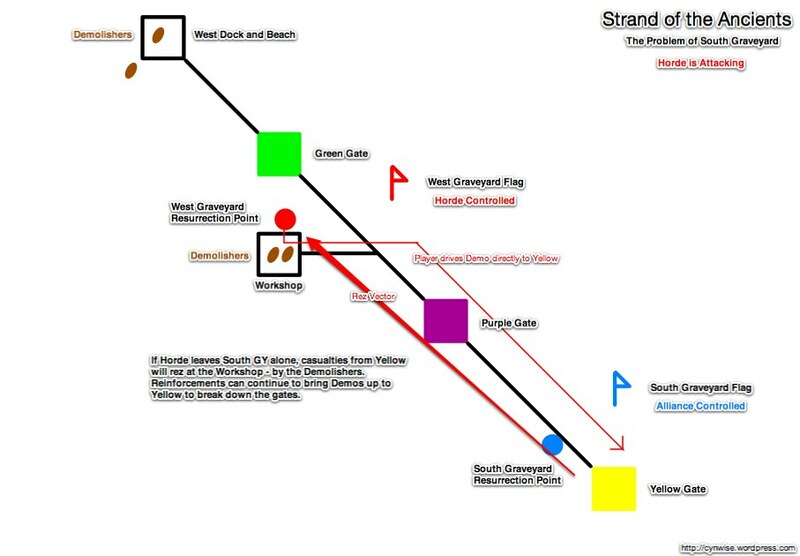 I actually saw someone spam strategy macros in Strand the other day. It was so refreshing. I’m horrid and brainless when it comes to PVP, but this series of guides is awesome in explaining the “whys” behind special and common tactics alike. 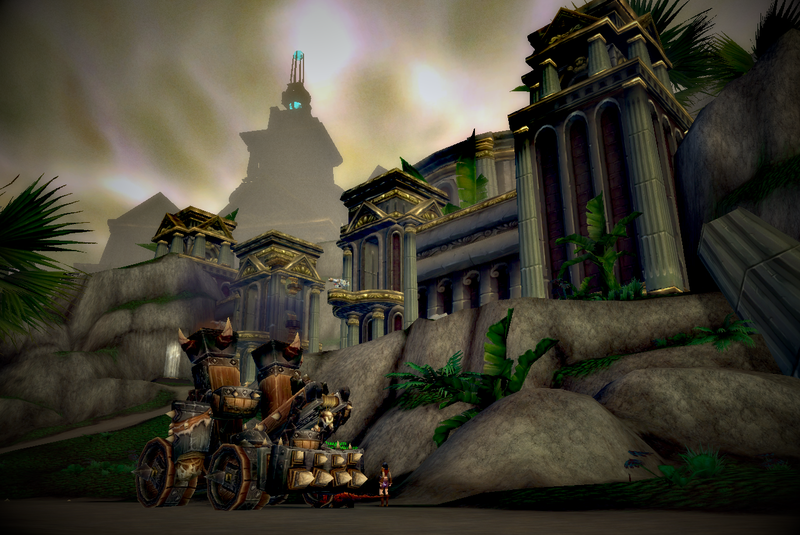 So kudos in making at least one dense PVE-er a little more adept at BG’s. You’re a rockstar, Cyn. I think of all those times when I first started playing SotA and capped South Graveyard… and I cringe. Obviously now being older and wiser I don’t cap it and hope when I enter that BG that nobody caps it but your post highlights it nicely for everyone, great work as always Cyn. I wish this had been posted a month ago before I capped the South GY… amidst the howls of “who the f capped South?” “Noob!” “Don’t ever play SotA again!” If someone had bothered to explain WHY instead of just insult, it would have been ever so much helpful. Awesome series, Cyn. Very thought provoking. I take the final graveyard when one of the second walls is down and neither of the primary graveyards have been captured.